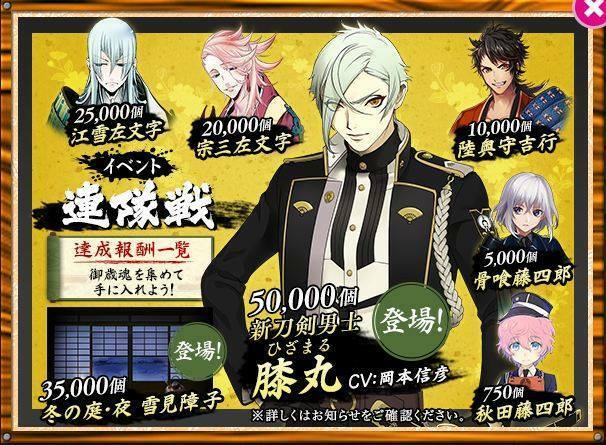 Another Touken Ranbu event is upon us! With the event campaign titled Regiment Battle, saniwas are required to collect Otoshimada to attain toudans, the Winter Night background, and the new toudan Hizamaru. Sources also confirmed that there’s a chance that you’ll get Higekiri on the final dance of the Expert map. For long time Touken Ranbu players, this event campaign is similar to the Monoyoshi Sadamune event when you’re required to collect a certain number of pearls to get him. Each player is given 3 passes daily. For those who want to do multiple rounds in a day, you have to pay around 1000 kouban to replenish your passes. Unlike the previous event, saniwas now have the option to switch teams in mid-battle (which is quite useful in completing the waves). Passes are immediately refreshed everyday at 5:00am and 5:00pm Japan Standard Time. Good luck to those who will be joining this event (I will be writing my event report here soon)! The event duration will be from December 29, 2015 to January 18, 2016 so be sure to use this holiday season to your advantage! Happy Holidays!